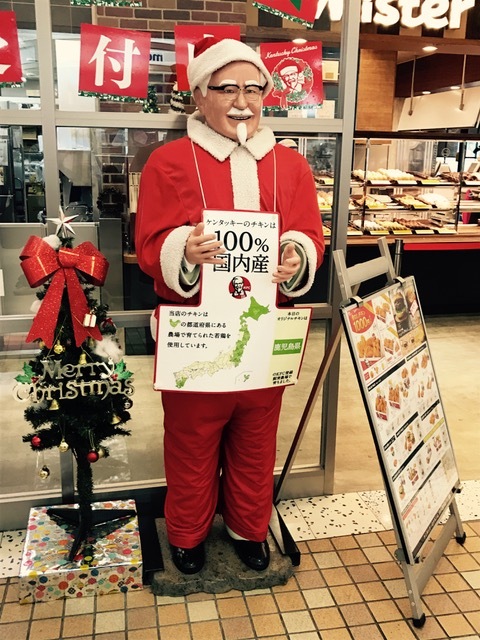 My trip back to good old America started with me being dropped off in Miyazaki for my overnight stay prior to my flight out the following morning. Miyazaki’s a large city and I readily looked forward to an afternoon to walking around and exploring the sights nearest my hotel. It was a Sunday so not a lot was going on but there was still plenty to take in. Firstly…I loved it. It’s not too often that a middle-aged guy like me anticipates an afternoon of just walking around and looking. I didn’t have my interpreter with me (our daughter Karalee) so finding my way back to my hotel after walking quite a ways from it would be my biggest challenge. I had booked my room through Travelocity.com and was pleasantly surprised how nice it was for only $58 a night (The Sky Tower Hotel). Here are some of the local sights that I found interesting. 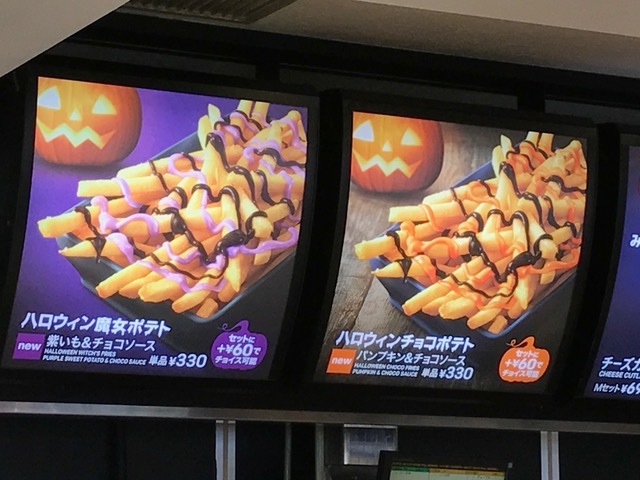 McDonalds Halloween Witch’s Fries. Purple sweet potato and chocolate sauce OR pumpkin and chocolate sauce. I didn’t try any. What I did find out was that McDonalds makes the same bland burgers for the Japanese as they do for us in the States. 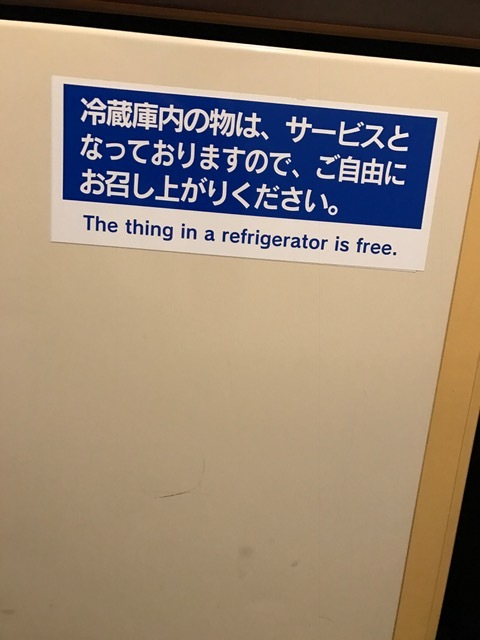 The “thing” in the refrigerator was a bottle of water. Did you know that beer cans in Japan have braille on them? True story! 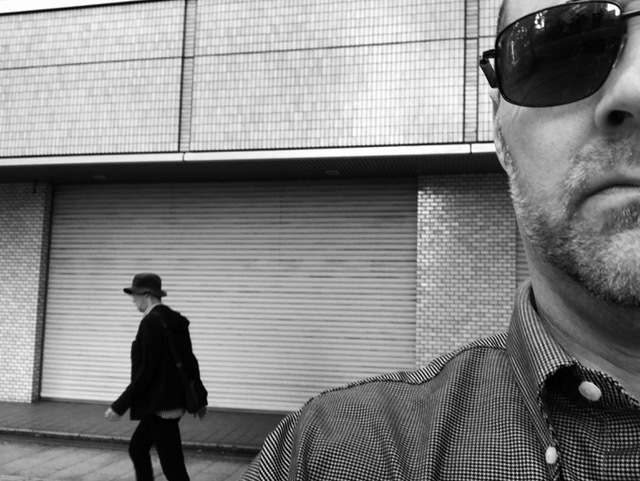 A rare photograph of the fedora-capped stranger behind me. 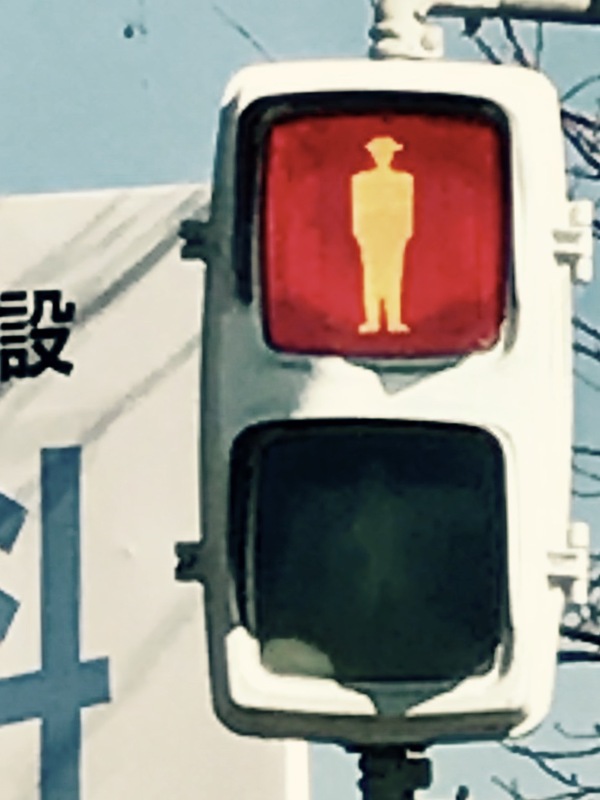 I tried to alert the proper authorities…in vain. So I walked around for a few hours, into the late afternoon, up and down streets and avenues packed with all kinds of shops. I found, of all places, a “Celtic Sport Pub” where I had a delicious American Blue Moon bottle of beer…for close to $9. Regardless of its high price it tasted awesome. I headed back towards my hotel where I contemplated eating in their hotel restaurant. I hedged thinking that I didn’t fly halfway across the world not to take a chance at a local place. I chose a place and took a seat. Thank goodness that the menu had photos and between me and my server my selection was made without any international incidents occurring. 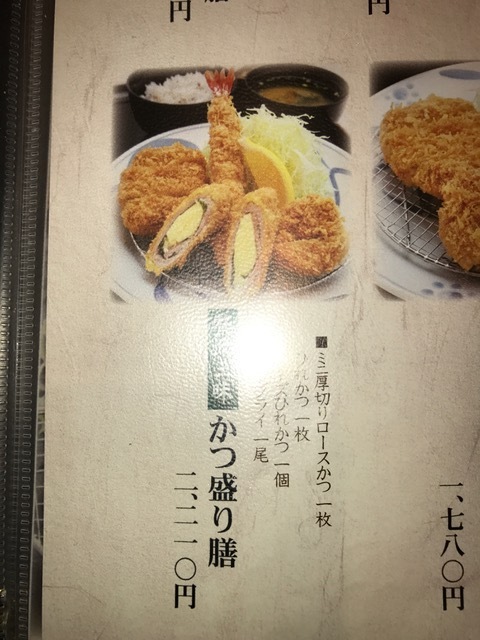 …uh…yeah…the deep fat-fried thing stuffed with…cheese? Delicious-ness!! 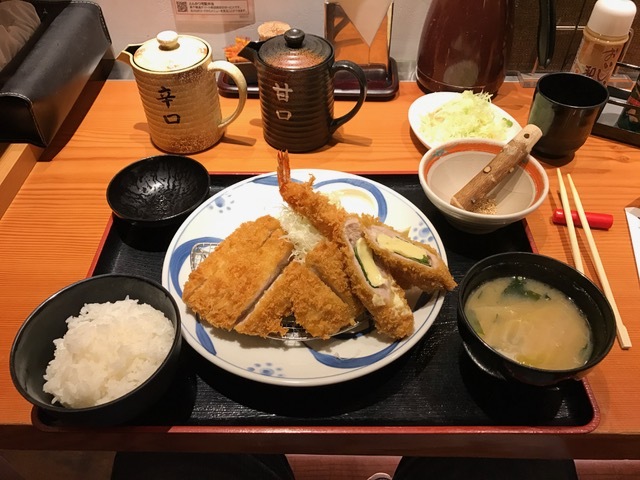 Basically a fried pork cutlet, prawn, soup and rice. 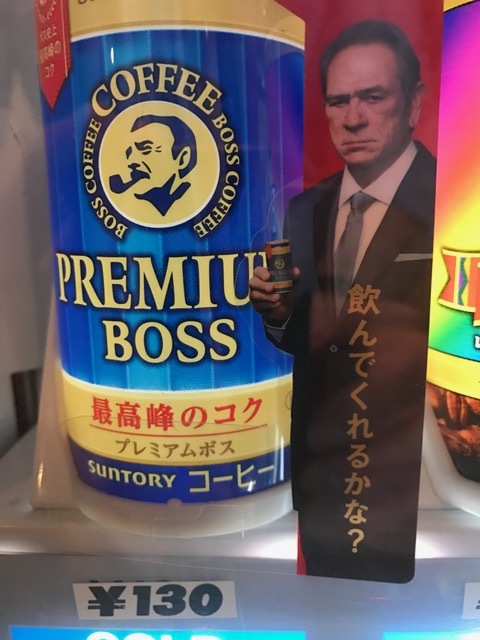 Tommy Lee Jones is the spokesman for Boss Coffee in Japan. Dead serious. He looks none too happy about it. Fast forward to the next morning. I had set up a taxi ride to the airport in the morning. That went great. Once arriving at the airport the ticket counter couldn’t “find” me. Literally…they had my passport and couldn’t find me on the 11 o’clock flight to Tokyo…and the lack of them understanding English and me Japanese didn’t help. 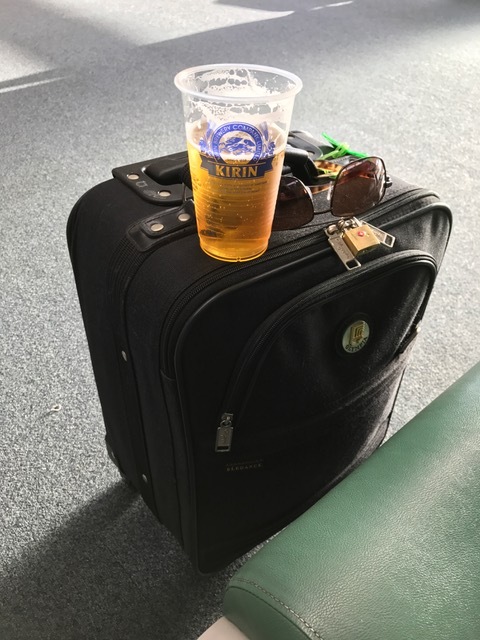 We were about ten minutes into this dilemma when I said “listen…I gotta be on that flight. I’ll buy a ticket and settle up with Travelocity.com when I get home”. The third of the three ticket counter ladies just smiled at me and continued typing away. Sweat beads ran down my back…it was warm and I was stressed. Finally one of the ladies asked if I had kept my old ticket stub from when I had arrived. CHA-CHING!! I had kept it!! I gave it to her and literally (LITERALLY) two minutes later I was walking away with my new ticket. Fast forward again…I landed in Tokyo’s Haneda airport on time. I had to transfer to Tokyo’s other international airport via a shuttle bus. I had somewhere like six hours before my flight to Chicago boarded. PLENTY of time (or so I thought). I hustled to the shuttle bus ticket area and found…CHAOS. Okay…not chaos…but an alarmingly large selection of transportation venues. I was kind of “oh…sh*t…” (ever been there? Not a good state of mind…am I right?) Anyway…if you believe in God (like I do) you’ll like this. I saw an airport employee, a young 20-something, walking towards me. I got her attention, without looking like a crazed middle-aged American, and asked her where I could buy a shuttle bus ticket to Narita. Get this…she was friendly, she took me to a ticket kiosk, changed its screen to read English, helped me buy the right ticket then led me to the bus stop and put me in the right line (mind you…there’s many buses coming and going by the minute). She was an Angel. Dead serious. My wait for the bus was like two minutes before I was boarded and heading the right way. Second Angel. 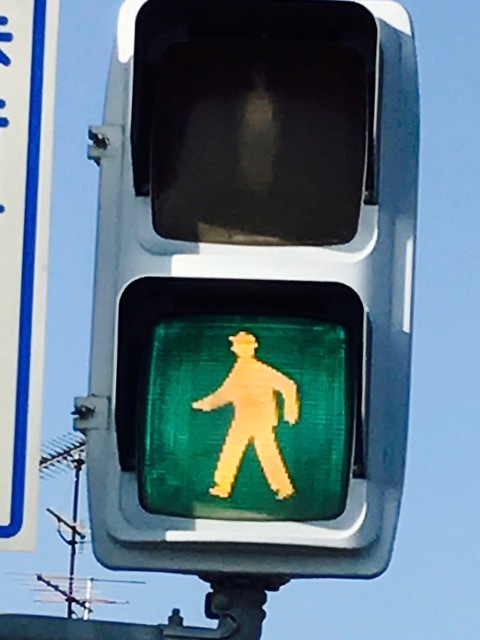 As we began our drive to Narita airport, which I thought would be a twenty minute ride, I struck up a conversation with a guy who I was pretty sure would understand English, Thomas. Thomas is black. 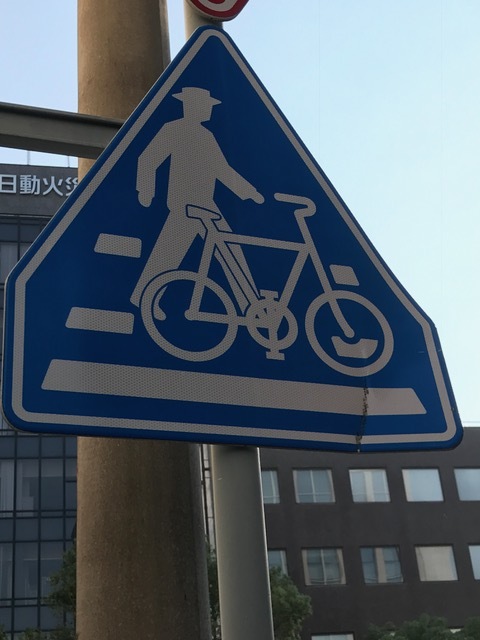 There aren’t many black people in Japan, like he was the only one in Japan at the time. Anyway…I asked Thomas how long the ride was. He replied “an hour and a half.” Holy cow!! I hadn’t planned for this at all. In my rush to find a ticket counter and thinking that the ride would be a short one I didn’t buy or bring something on the bus to drink, and I was parched! Get this…Thomas not only calmed me down (I’m a little high-strung when traveling…) he gave me his unopened bottle of apple juice (I’m not a big fan of apple juice BUT this one tasted wonderful!!) and gave me a great person to talk and listen to during the ride and told me which stop to get off at once at Narita. Thomas was great. He’s Methodist by the way. Once I found my gate I had a couple of hours to kill. I was flying back in economy…not quite the business class that I had hoped for…but I was going home. The plane would take off at 6 PM Tokyo time with a 3 PM landing in Chicago. So long Japan! Its been fun. Let’s do it again soon. I used to be a nervous-nelly on flights. Twitching at every little chime, buzz or sound. Not anymore. Old Rich Ripley is a world-traveler. I write. I read. I have a few drinks. I watch TV. Flying over an ocean…? No problem. Forty minutes into our flight we had turbulence. I mean real-live roller coaster, people shouting, plane shaking, pilot telling the flight attendants “ATTENDANTS GET TO YOUR SEATS”. It was scary. I thought to myself “this is the way that Hollywood portrays the moments before a plane crash.” Surprisingly enough…I didn’t get overly concerned, but enough to have an impromptu chat with the Lord concerning aforementioned flight over said ocean. The turbulence only lasted a few minutes…but long enough to leave a lasting impression. We reached Chicago unscathed. I had to really hustle to make it from my “big jet” gate to my little old “regional jet gate”. I had less than 70 minutes to find my way through customs and on towards my new gate…which I didn’t know where it was…yet. After clearing customs (when you’re a bigshot like me, they’re just happy to have me back in the States…you feel me?) I was starting to find my bearings as to where I needed to go next. I saw a couple of the flight crew from my flight walking next to me. I made a remark about the turbulence that we had experienced, had a nice laugh and I asked them if I could go out the door that they were exiting by…..and my next Angels were there. They asked me what gate I was flying out from and once they heard that they replied “we’re walking right past it. Come along with us!” Dear Lord…these two attendants made the fifteen minute jaunt through a major international airport, onto a shuttle train, through security and right to my gate back to Iowa so easy. I mean it…our Good and Gracious Lord made coming home so easy. From the girl in Tokyo to Thomas on the shuttle to these two attendants walking me to my gate after working an eleven hour flight…just AWESOME. My flight back to Cedar Rapids from Chicago is barely thirty minutes long. I look down on the lights of Chicago fading to the east as the darkened farm fields of rural Illinois and Iowa slip under us. I see the Mississippi River, the moon reflecting on it…it won’t be long now. A combine illuminates the corn rows ever so slightly before taking them it. Its funny what a person recognizes, if even from thousands of feet in the air above it. I see a farm houses stretched down rural roads every so often…shining like little warm mercury-lit beacons…like bread crumbs left along a trail…guiding this Iowan back home. We land, the cool early November air washes over me in the jet-bridge. Dear God…what a journey. Thank you for carrying me home.